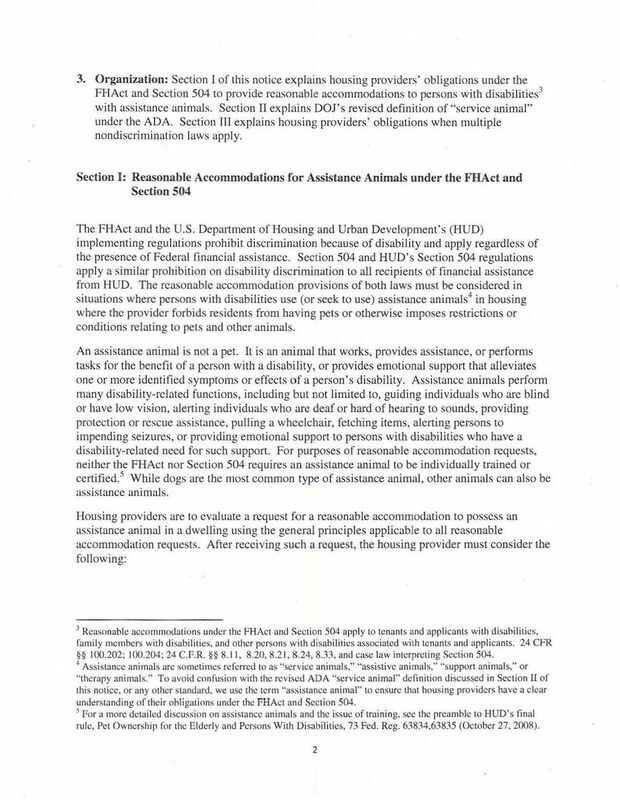 Download "Subject: Service Animals and Assistance Animals for People with Disabilities in Housing and HUD-Funded Programs"
1 U.S. DEPARTMENT OF HOUSING AND URBAN DEVELOPMENT WASHINGTON. DC 204W-2(10(] OFFICE OF FAIR HOUSING AND taual OYPORTUNJTY SPECIAL ATTENTION OF: HUD Regional and Field Office Directors of Public and Indian Housing (PIH); Housing; Community Planning and Development (CPD), Fair Housing and Equal Opportunity; and Regional Counsel; CPD, P11-1 and Housing Program Providers FHEO Notice: FHEO Issued: April 25, 2013 Expires: Effective until Amended, Superseded, or Rescinded Subject: Service Animals and Assistance Animals for People with Disabilities in Housing and HUD-Funded Programs 1. 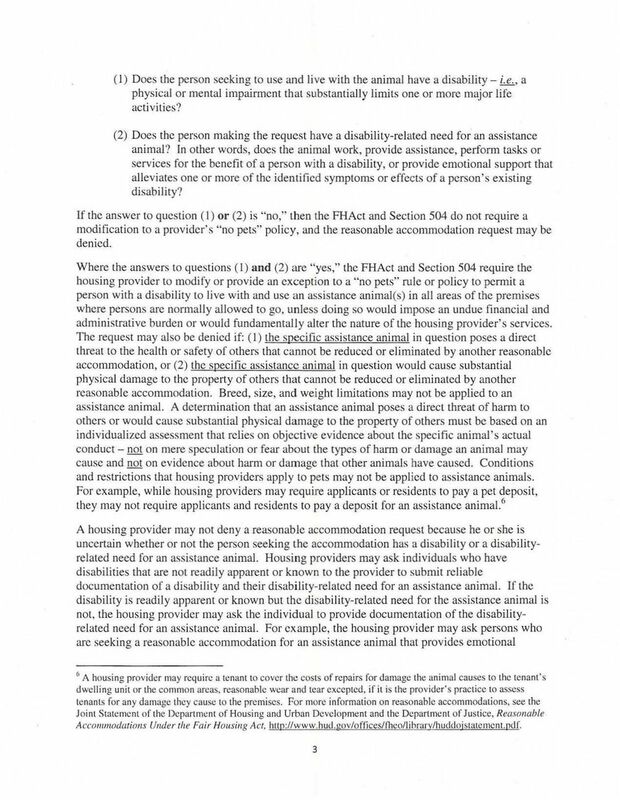 Purpose: This notice explains certain obligations of housing providers under the Fair Housing Act (FHAct), Section 504 of the Rehabilitation Act of 1973 (Section 504), and the Americans with Disabilities Act (ADA) with respect to animals that provide assistance to individuals with disabilities. 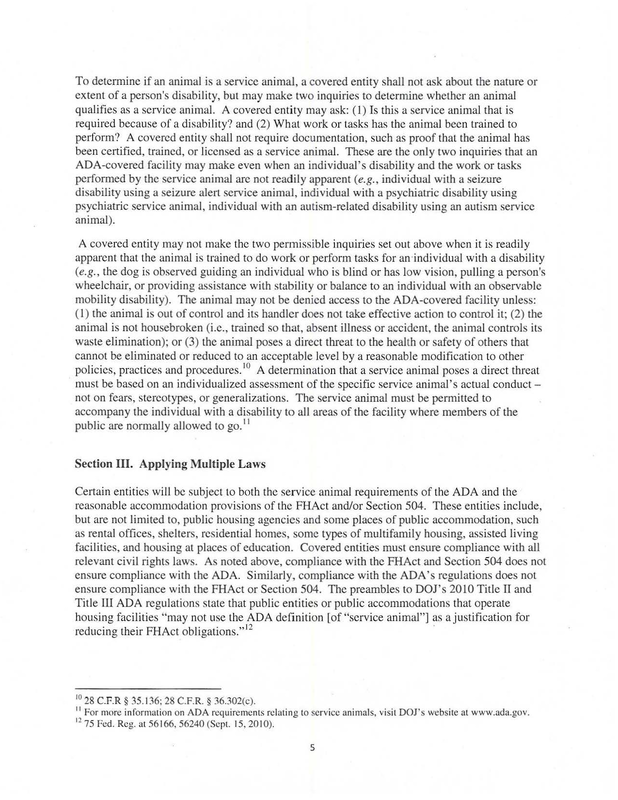 The Department of Justice's (DOT) amendments to its regulations' for Titles II and III of the ADA limit the definition of "service animal animal" under the ADA to include only dogs, and further define "service animal" to exclude emotional support animals. 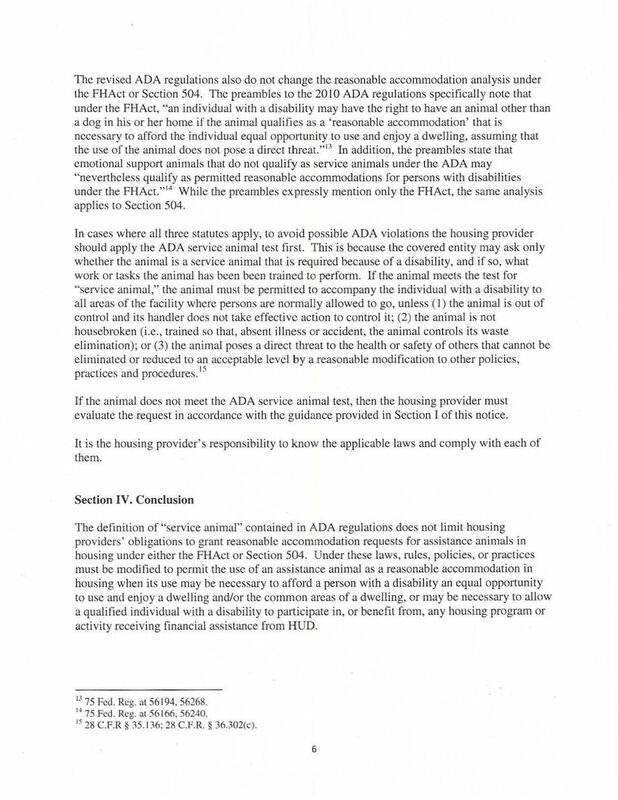 This definition, however, does not limit housing providers' obligations to make reasonable accommodations for assistance animals under the FHAct or Section 504. 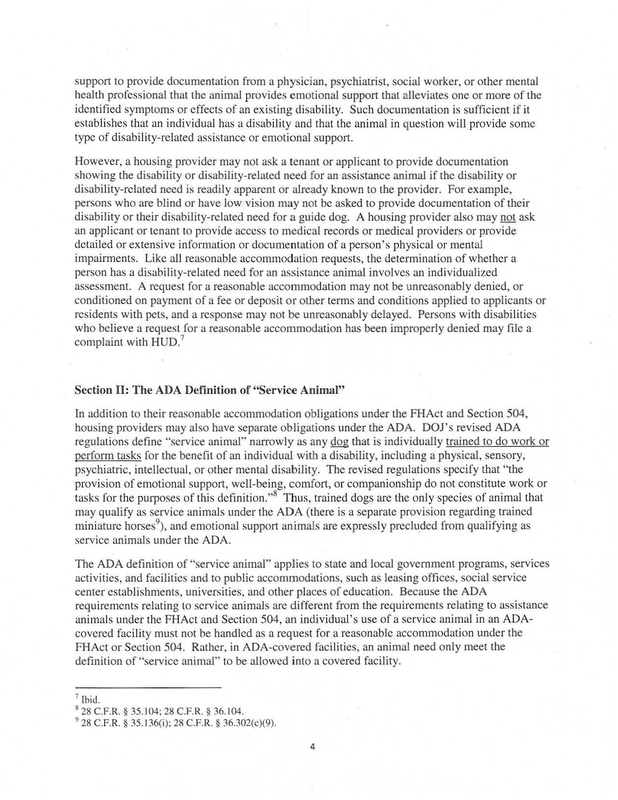 Persons with disabilities may request a reasonable accommodation for any assistance animal, including an emotional support animal, under both the FHAct and Section 504. 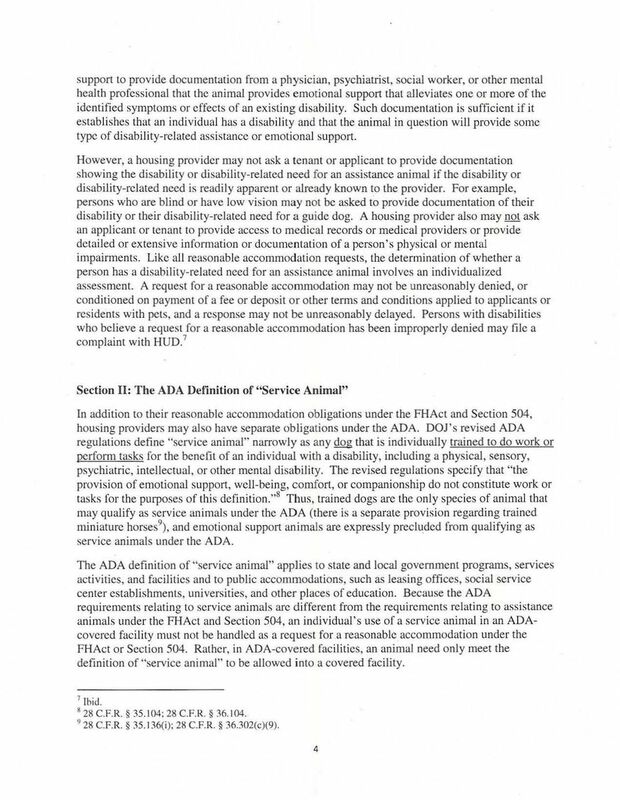 In situations where the ADA and the FHAct/Section 504 apply simultaneously (e.g., a public housing agency, sales or leasing offices, or housing associated with a university or other place of education), housing providers must meet their obligations under both the reasonable accommodation standard of the FHAct/Section 504 and the service animal provisions of the ADA. 2. 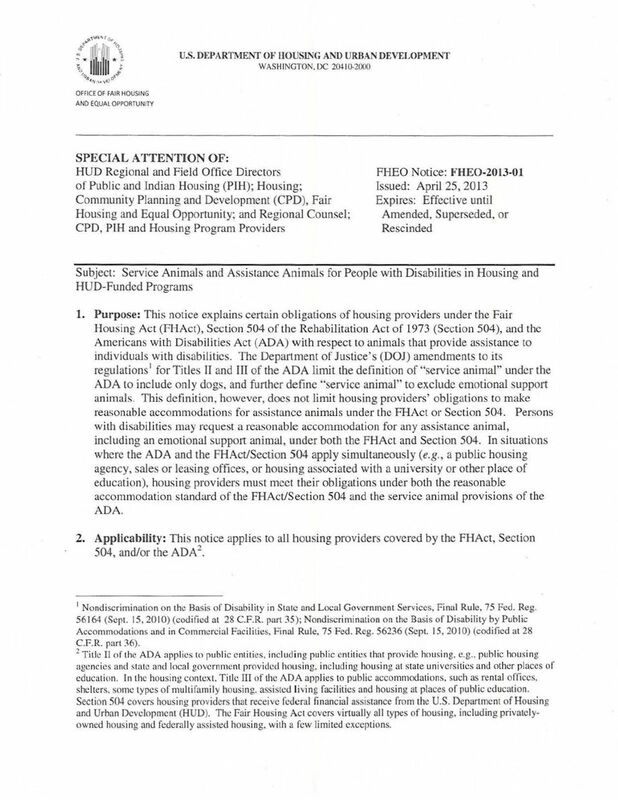 Applicability: This notice applies to all housing providers covered by the FHAct, Section 504, and/or the ADA2. Nondiscrimination on the Basis of Disability in State and Local Government Services, Final Rule, 75 Fed. Reg (Sept. 15, 2010) (codified at 28 C.F.R. 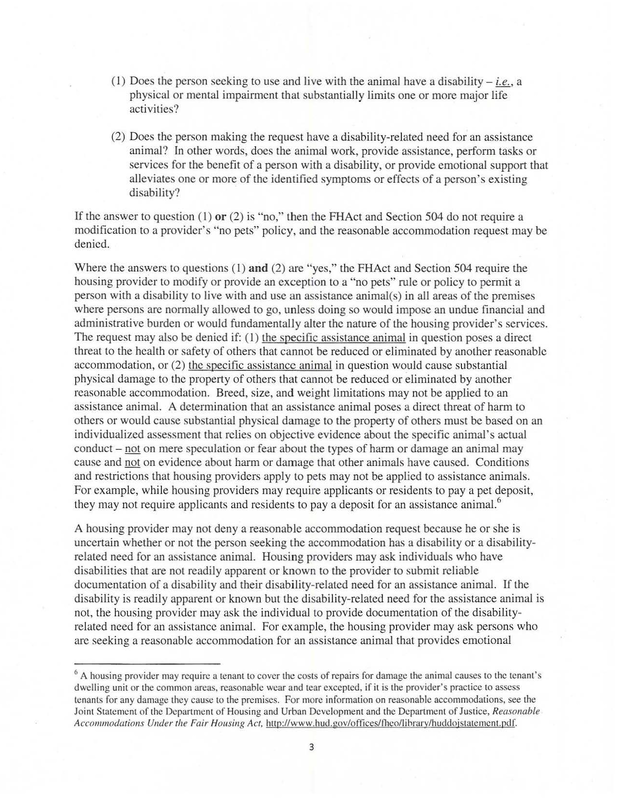 part 35); Nondiscrimination on the Basis of Disability by Public Accommodations and in Commercial Facilities., Final Rule, 75 Fed. Reg (Sept. 15, 2010) (codified at 28 C.F.R. part 36). 2 Title II of the ADA applies to public entities, including public entities that provide housing, e.g., e.g.. public housing agencies and state and local government provided housing, including housing at state universities and other places of education. In the housing context. Title III of the ADA applies to public accommodations, such as rental offices, shelters, some types of multifamily housing, assisted living facilities and housing at places of public education. Section 504 covers housing providers that receive federal financial assistance from the U.S. Departme.nt of Housing and Urban Development (HUD). The Fair Housing Act covers virtually all types of housing, including privatelyowned housing and federally assisted housing, with a few limited exceptions. FAIR HOUSING ACT. The Fair Housing Act HOT TOPICS IN FAIR HOUSING. What is considered a reasonable accommodation under the Fair Housing Act? The Fair Housing Act is codified at 42 U.S.C. 3601-3619. 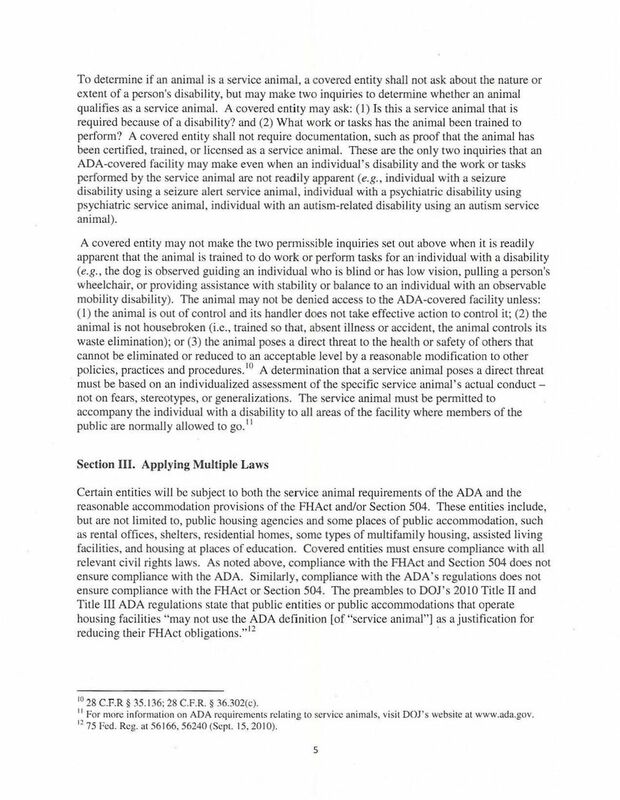 SAMPLE POLICY: SERVICE ANIMALS Second Edition (December 2007) Service Animals Sample Policy We have developed this sample policy to assist you and your staff in dealing with issues involving service animals. THE BASICS OF THE FAIR HOUSING ACT. Presented by: Sarah Fisher Idaho Human Rights Commission Sarah.fisher@labor.idaho. Case: 5:14-cv-01992 Doc #: 1 Filed: 09/08/14 1 of 14. PageID #: 1 IN THE UNITED STATES DISTRICT COURT FOR THE NORTHERN DISTRICT OF OHIO EASTERN DIVISION UNITED STATES OF AMERICA, : : Plaintiff, : : v.
POLICY STATEMENT Wayne State University ( WSU or the University ) is committed to providing reasonable accommodations to persons with disabilities, fulfilling its obligations under state and federal law. 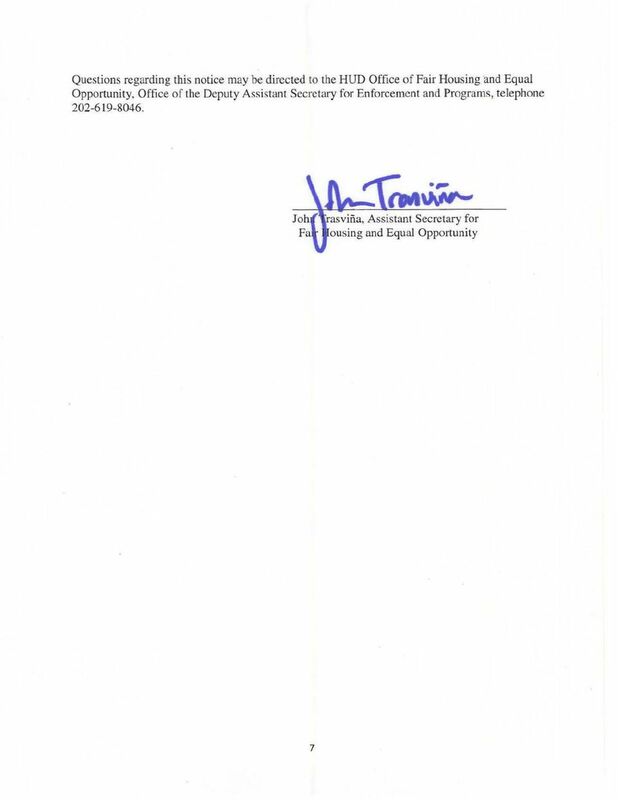 UNITED STATES OF AMERICA DEPARTMENT OF HOUSING AND URBAN DEVELOPMENT OFFICE OF ADMINISTRATIVE LAW JUDGES ) ) ) FHEO No.